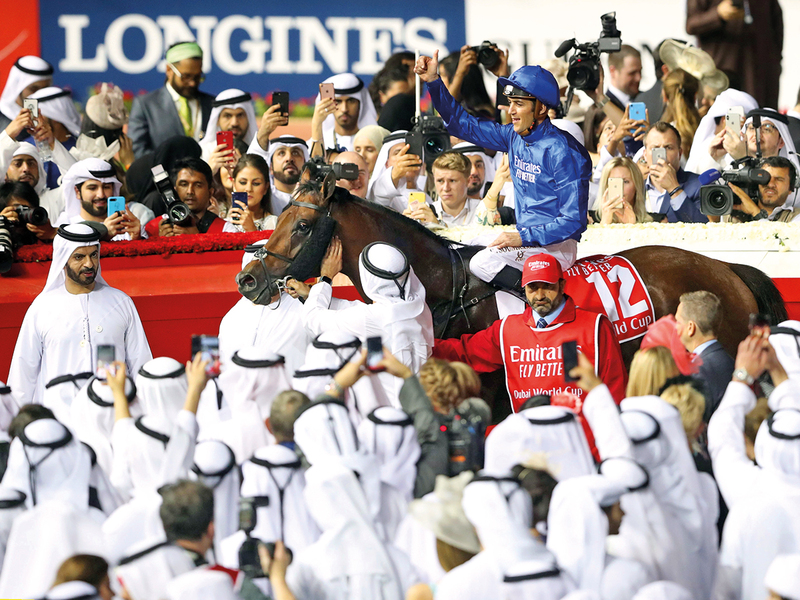 Dubai: Renowned Godolphin handler Saeed Bin Surour has hailed Thunder Snow as one of his greatest horses after the five-year-old’s epic victory in the $12 million Dubai World Cup (G1) on Saturday night at Meydan Racecourse. Despite drawing the disparaging outside gate in the 12-horse field Bin Surour’s charge effortlessly dealt with the obstacle, raised his game and willed himself into winning the 2,000 metre contest for a record second successive year. I’ve been privileged to train some great horses for Godolphin in my career and Thunder Snow is right up there with the best of them. No horse had every won the great race twice. “It’s a dream to win the Dubai World Cup, but it’s more of a dream to win it twice with the same horse,” Bin Surour told Gulf News on Sunday. Bin Surour’s pantheon of champions is an exhaustive lists and there will be many more to emerge in the future, but for the moment there is only once horse that matters, Thunder Snow. After winning the Dubai World Cup 12 months ago, Thunder Snow embarked on an ambitious mission that would take him to the UK and onward to the US where the prestigious Group 1 Juddmonte Stakes at York and the Breeders’ Cup Classic at Churchill Downs in Kentucky, were his principal targets. is the prize money that Thunder Snow has won in his career, highlighted by 7 wins. Thunder Snow went down by a nose to Discreet Lover in the Jockey Club Gold Cup (G1), his prep race for the Classic, before delivering a massive performance to finish a close third behind Accelerate and Gunnevera in the Churchill Downs showpiece. 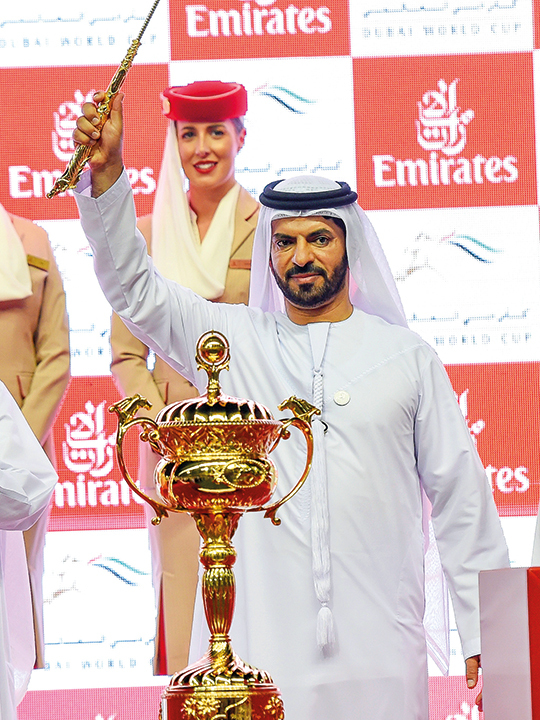 “The general plan is to take him to America again, where he will have a similar program, culminating in the Breeders’ Cup Classic,” the Emirati handler said. Bin Surour also pointed out that the final decisions on the races Thunder Snow would run in would be made by Godolphin founder, His Highness Shaikh Mohammad Bin Rashid Al Maktoum, Vice-President and Prime Minister of the UAE and Ruler of Dubai. “All decisions are made by Shaikh Mohammad,” revealed Bin Surour. “He is involved in all that goes on in the stable. He planned Thunder Snow’s programme and training for the Dubai World Cup. Asked if Thunder Snow would attempt to win a third Dubai World Cup in 2020, Bin Surour would not deny or confirm what the plan was. is the official rating of Godolphin’s 5-year-old Darley home-bred. Bin Surour also acknowledged that one of the remarkable qualities that Thunder Snow has is his durability and derring-do attitude. “He’s a very, very tough horse,” he said. “They don’t come tougher. It takes a tough horse to stay in a fight and win a race like the Dubai World Cup. Bin Surour also credited jockey Christophe Soumilion, who rode out of his skin to carry his horse to the finish.